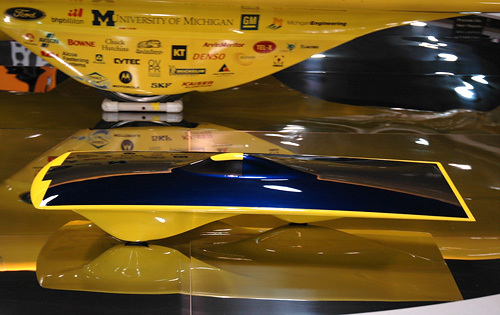 [NAIAS 2008] University Of Michigan Continuum – About As Green As A Car Can Get | OhGizmo! [NAIAS 2008] Dodge Avenger Stormtrooper – Is This What Vader Drives? By Andrew Liszewski on 01/17/08 • Leave a comment! Besides weird foreign cars and ridiculous custom rides, the downstairs section of the Detroit Auto Show also includes a few exhibits showing off work done by university students. 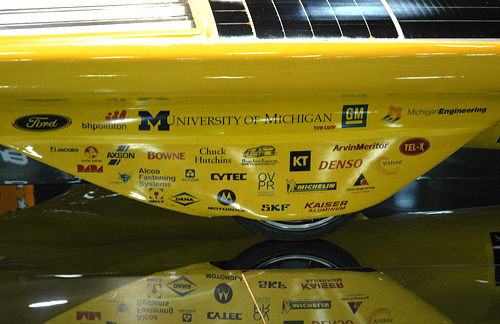 One of those universities that is usually always on hand is the University of Michigan and their Solar Car Team. Their latest effort called the Continuum was on display and while the team usually places very well in the World Solar Challenge, this year they unfortunately had a bit of a fender bender during the race as is evident on the front corner of the car in the above shot. Even with the accident though, they still managed to place 7th, which is pretty impressive given how much time they lost due to repairs. 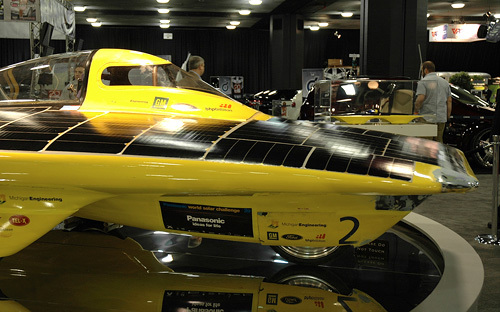 What I find particularly interesting about the World Solar Challenge is how every year the race itself kind of evolves. 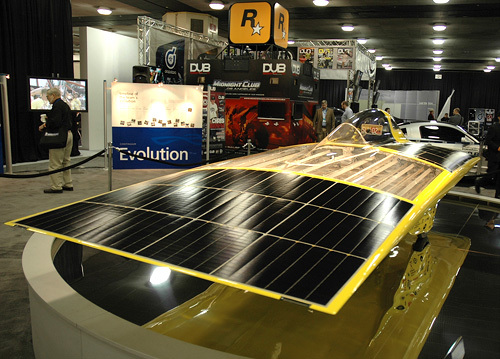 Earlier versions of the Solar Car Team’s vehicle had the driver laying down, which improved aerodynamics and reduced drag. But speaking to one of the student representatives at the booth, the driver was actually required to be in a sitting position for this year’s race, which of course increases the challenge when it comes to designing the car. 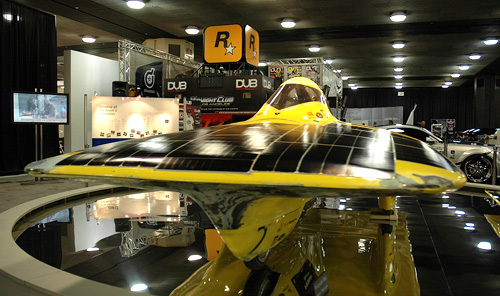 The race organizers also limited the size of the solar cell clusters on the cars this year. 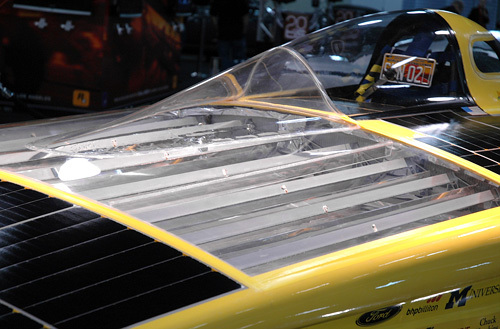 To compensate the U of M Solar Car Team developed a clever system where sunlight was concentrated on special high yield solar cells using parabolic mirrors, which you can see in the above shot. I was surprised to hear that even with these new limitations, the car can still achieve speeds upwards of 90mph! While it’s not like we’ll all be driving solar powered cars anytime soon, it’s still interesting to see how this car has evolved and improved over the years. There are a few more pics of the Continuum after the jump. 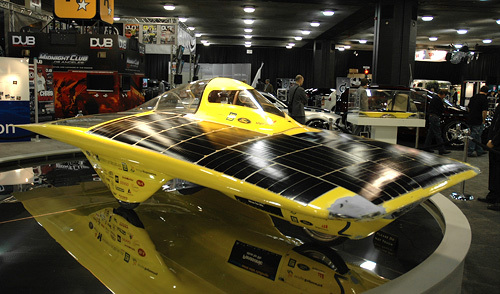 The parts needed to build an all solar car, as well as the development facilities don’t come cheap, so the Continuum has quite a collection of corporate sponsors including General Motors, Ford, Michelin and Motorola. This miniature version of the Continuum is actually a scale mockup designed to be tested in wind tunnels. It doesn’t make sense to build a full size version and then stick it in a wind tunnel to see how it performs. So the smaller versions help ensure the full size car is already well streamlined before it’s ever even assembled.